"General view of Colwood Golf Course, Victoria, BC." 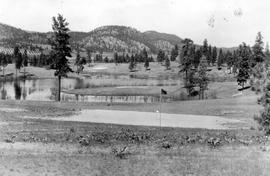 "Kelowna from the golf links". "Kelowna golf links, Okanagan Valley". "Oak Bay golf links and Olympic Range, Victoria, BC, Canada." "Qualicum Seaside Hotel and Golf Course - Now Open." "Royal Colwood Golf Links, Victoria, BC." "View from golf club hill east across valley", No. 41. 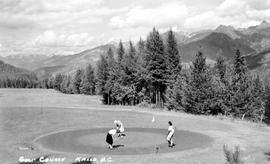 A golf course in Revelstoke. A golf tournament at the Victoria Golf Club. Bishop Schofield, Primate Archdeacon Owen, and Archdeacon Heathcote after a game at the Colwood Golf Club near Victoria. Chilliwack Golf and Country Club. Clubhouse at the Lanagara Golf Course, Vancouver. Clubhouse, Royal Colwood Golf Club. Construction of the clubhouse at the Royal Colwood Golf and Country Club, Victoria; P. Leonard James, archtect.